With the constant need for speed in every aspect of our lives, you simply can’t afford to have a slow website these days. 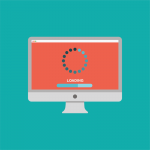 Studies show that if a site takes more than three seconds to load, most of us will leave to find another one that won’t make us wait. What’s worse, this translates to a 7% loss in conversions for every one-second delay. So, even if you think your site is already fairly quick, it’s always worth looking for ways to make your website speed even faster and stay ahead of the game. Today we’re looking at four ways you can improve your website speed. While this isn’t an exhaustible list of top tips, it’s going to get you off to a flying start! Every time someone visits a page on your site, all the content of that page is translated to their browser by way of HTTP requests. Today, our web pages are full of images, videos, text, plugins, scripts and other files, which are great for the end-user experience. However, according to Yahoo, 80% of your website’s load time is actually spent downloading all these components of your front-end, so it’s pretty important to make sure they aren’t slowing down the process. In addition, every one of these components is a brand new file request for your server to deal with every time the page is loaded. Your server only has the capacity to serve a specific number of file requests per second, so if it’s inundated with too many to handle this is going to really put the brakes on your website speed. Making certain files smaller and combining them reduces the size and total number of files on each of your pages. This in turn cuts the number of HTTP requests to your site. This step is especially important if you use a template website builder, like WordPress or Wix, as they can sometimes have naturally messy coding. However, the good news is they also have plugins that make the combining of files simple and easy. DNS management is absolutely key to the smooth running of your site. As explained in one of our previous blogs, a DNS server is what allows URLs to be translated into IP addresses so your browser can transport you to the website you asked for. This process of translation is called a DNS lookup. If this is slow, it takes much longer for a browser to locate your site and slows down the journey for people who want to use it. Tip: DNS management systems such as SafeDNS are ideal for ensuring you have the most streamlined DNS protocol to increase your website speed. Our final tip is to find the right hosting provider for you to make your site as fast as it can be. To put it simply, when the server supporting your site is the best it can be, your website performance is also enhanced. And, with so many companies now using managed cloud services to host their websites, this step is crucial for those who wish to keep up with the competition and ensure a speedy service. Is your website slowing you down? Find out how we can help by calling one of our hosting experts today on 0800 231 5917.